Mongolia is a landlocked country in East Asia known for vast, rugged expanses and nomadic culture. 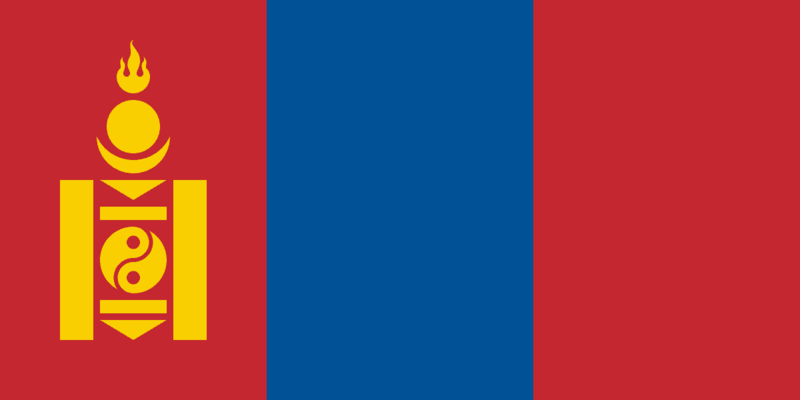 The official name of the country is Mongolia. Mongols have a type of singing called throat singing. This makes it possible to make two sounds at the same time in one's throat. The two countries that border Mongolia are Russia on the north and China on the south, east and west. The official language is Mongolian. Just outside of the capital city of Mongolia is a statue of Genghis Khan atop a horse. It is 131 feet tall and the tallest statue in the world of a horse. As of 1 January 2017, the population of Mongolia was estimated to be 3,037,393 people. At 1,564,116 square kilometers (603,909 square miles), Mongolia is the 18th largest and the most sparsely populated fully sovereign country in the world. It is also the world’s second-largest landlocked country behind Kazakhstan. Ulaanbaatar, formerly romanized as Ulan Bator is Mongolia’s capital and largest city. Located in north central Mongolia, the city lies at an elevation of about 1,310 meters (4,300 feet) in a valley on the Tuul River. The Bactrian camel (two humped camel) is a species of camel native to Mongolia. The country contains very little arable land, as much of its area is covered by grassy steppe, with mountains to the north and west and the Gobi Desert to the south. War, salty milk tea is common in Mongolia. The first dinosaur eggs found in the world were found in the Gobi Desert in the 1920s. Mongolia is one of the world’s highest countries, with an average elevation of 1,580 meters (5,180 feet). Khüiten Peak is the highest point in Mongolia, on the west side of the country along the border with China. It is 4,374 meters (14,350 feet) high and has a permanent snow cap. There are 13 times more horses living in Mongolia than people. Southern Mongolia is dominated by the Gobi, which is the largest desert in Asia and is the fifth largest in the world. in total, with 24 National Parks. Khustain Nuruu National Park was established in 1993 and is about 100 kilometers (62 miles) southwest of Ulaanbaatar. The 50,620-hectare (12,5080-acres) reserve protects Mongolia’s wild horse, the takhi, and the reserve’s steppe and forest-steppe environment. In addition to the takhi, there are populations of maral (Asiatic red deer), steppe gazelle, deer, boar, manul (small wild cat), wolves and lynx. Sheep outnumber humans in Mongolia 35 to 1. Mongolia has 4 UNESCO world heritage sites. The Erdene Zuu Monastery is probably the earliest surviving Buddhist monastery in Mongolia. Located in Övörkhangai Province, approximately 2 km north-east from the center of Kharkhorin and adjacent to the ancient city of Karakorum, it is part of the Orkhon Valley Cultural Landscape World Heritage Site. Mongolian horsemen are believed to have invented ice cream more than 700 years ago. They were carrying cream in containers on horseback in the winter across the Gobi Desert and it shook until it became ice cream. The Gandantegchinlen Monastery is a Chinese-style Tibetan Buddhist monastery in the Mongolian capital of Ulaanbaatar that has been restored and revitalized since 1990. The Tibetan name translates to the “Great Place of Complete Joy”. This monastery is one of Mongolia’s most important, and also one of its biggest tourist attractions. The population of Mongolia in 2016 is estimated to be more than 3 million people. Mongolia encompasses an area of 603,909 square miles. The national dish in Mongolia is buuz, which is a steamed dumpling filled with mutton or beef. The Genghis Khan Equestrian Statue, part of the Genghis Khan Statue Complex is a 40 meters (130 feet) tall statue of Genghis Khan on horseback, on the bank of the Tuul River at Tsonjin Boldog (54 km (33.55 mi) east of the Mongolian capital Ulaanbaatar), where according to legend, he found a golden whip. The statue is symbolically pointed east towards his birthplace; it’s the highest statue representing a man on a horseback in the world. Mongolia is landlocked by China and Russia. It is the second largest landlocked country in the world, after Kazakhstan. The Mongol Empire gained power as Genghis Khan and his sons conquered much of Asia and Europe during the 13th century. In the 16th century, Tibetan Buddhism began to spread in Mongolia. By the early 1900s, almost one-third of the adult male population were Buddhist monks. The southern portion of Mongolia, known as Inner Mongolia, is part of China. The northern region became independent from China in 1921 with Russia’s help. Mongolia became a communist country in 1924, but in 1990 multiparty elections were held by the people. Mongolia has the lowest population density of any country in the world. The first United States president to visit Mongolia while in office was George W. Bush, in 2005. Approximately 30% of the population is nomadic or semi-nomadic; horse culture is still integral. More than one-third of Mongolia's population is under the age of 18. The majority of its population are Buddhists. The non-religious population is the second largest group. Mongolia gets on average 266 days of sunshine each year. Because of this Mongolia is often referred to as the 'Land of the Blue Sky'. Although accepted into the United Nations in 1961, more than 100 countries refused to recognize it as a country until 1987. Mongolia’s temperature can fluctuate as much as 35 degrees in one day. consists of dairy products, meat, and animal fats. Use of vegetables and spices are limited. The capital city of Mongolia is Ulaanbaatar, which translates to mean 'red hero'. In 2008 the population of the capital was 1 million. The average temperature in the capital is -1 degree Celsius. Mongolia’s national drink, fermented mare’s milk, is called airag or kumiss, in other parts of Central Asia. The national animal of Mongolia is the Przewalski Horse. The oldest Buddhist monastery in Mongolia is Erdene Zuu Monastery, built in 1586. The national bird of Mongolia is the Saker Falcon. Scabiosa ‘Butterfly Blue’ was named as the National Flower of Mongolia. The flower symbolizes Mongolia`s lifestyle in harmony with nature. Naadam is a traditional festival in Mongolia. The games are Mongolian wrestling, horse racing, and archery, and are held throughout the country during midsummer. In 2010, Naadam was inscribed on the Representative List of the Intangible Cultural Heritage of Humanity of UNESCO. Mongolia used to be known as Outer Mongolia. The largest Mongolian wrestling tournament involved 6,002 participants. It was organized by the Mongolian National Wrestling Federation (Mongolia) and was held in Ulaanbaatar, Mongolia, between 17 and 25 September 2011. Mongolia only has one university. It is called Mongolia State University. It opened in 1942. Khöömei or throat singing is a form of singing originating in western Mongolia, in the Altai mountains. The performer imitates sounds of nature, simultaneously emitting two distinct vocal sounds: along with a continuous drone, the singer produces a melody of harmonics. Ulaanbaatar has an average annual temperature of −0.4 °C or 31.3 °F, making it the coldest capital in the world. Many people in Mongolia live in yurts, or 'ger' which is a traditional shelter for the Mongols. The Mongolian Stock Exchange is the smallest in the world and is housed in a refurbished children’s cinema. One- third of the world's population of snow leopards lives in Mongolia. The snow leopard is also native to Mongolia.